Thorns and thistles make delicious eating if you know know Middle-Eastern ways to cook them. Snooping around the open-air market in my town, I was glad to see thistles and thorns piled up on the wooden stands. (See our post about Israeli open-air markets.) Spiky artichokes and bristly cardoons, to be exact. If you’re looking to enrich your menus with less meat and more vegetarian food, take advantage of these thorny vegetables while they’re still in season. Artichokes require a bit of work, but once they’re cooked, you need only drain them and dip their leaves into melted butter or garlicky olive oil, scraping the fleshy bottom parts off with your teeth. The best part is the heart, with its smooth, buttery flavor. You can serve artichoke hearts smeared with a little za’atar pesto (fresh za’atar is also in season now). Also delicious is this unusual dip recipe using fresh, or to save work, frozen artichoke hearts. Preheat oven to 400 F, 190 C.
Blend artichoke hearts with the rest of the ingredients, except for the Parmesan cheese, in blender or food processor. Using a spatula, scrape the artichoke mix out of the blender into a small baking dish. Scatter the Parmesan cheese over all. Serve the dish hot, with toasted pita wedges or crackers for dipping. 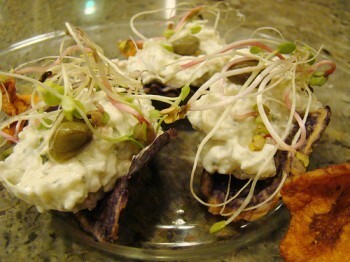 Set out plates of capers and alfafa sprouts for garnish, if desired. Note: For fresh artichokes, chop the stem off level with the artichoke bottom. 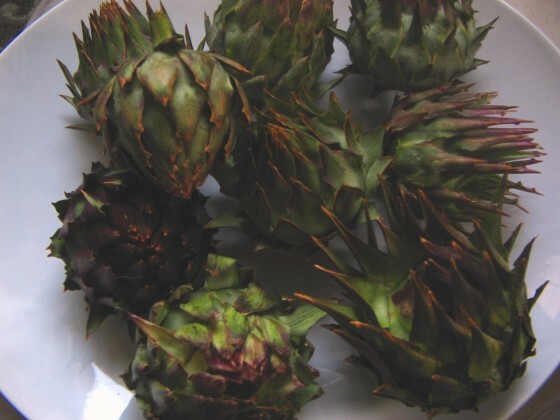 Trim away the thorny tips with scissors, wash well between the leaves, and cook in boiling salted water for 30 minutes or until a leaf easily comes away from the body of the artichoke when pulled out. Drain, let cool, and remove all the leaves plus the feathery choke. The cuplike heart of the artichoke remains. Photo of artichoke spread by norwhichnuts via Flickr.